In the middle of summer or the middle of winter trout is always on the menu. With a fish like trout there’s not a lot of messing about you should do with it. Dan adds in a few other flavours to the pan and pairs the fish with baked onion and thyme. • Bake in a hot oven for 1 hour total – once soft (approx 20 minutes in) skewer with springs of thyme and keep baking until onions are very soft and almost falling apart. • Pan fry trout in a large frying pan over a medium eat with canola oil and pinch of salt, turning once. • Remove and reserve on serving platter. • Add butter to the pan and increase heat. When butter starts to brown add almonds and squeeze of lemon. Stir well and pour over trout. 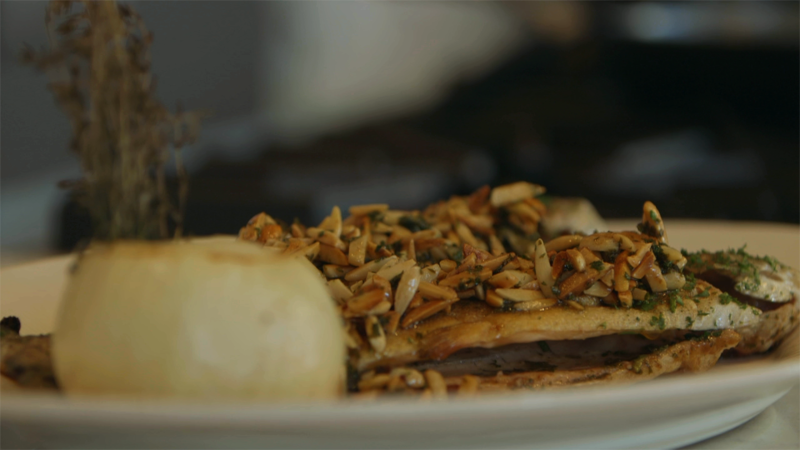 • Add the baked onion to your platter and finish the trout almondine with chopped parsley and serve immediately.